Marion Frances Mehigan Masek died peacefully at her home in San Juan Capistrano, California on Saturday May 5, 2018, surrounded by her loving family. She was 92 years old. 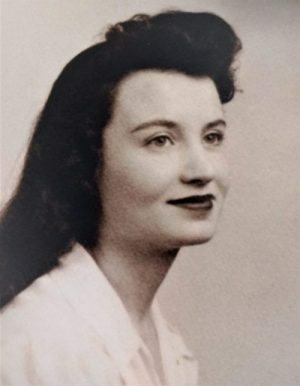 Marion was born on March 11, 1926 in Shorewood, Wisconsin to Joseph and Sara (Sadie) Mehigan. On July 7th, 1947, Marion married George Goode Masek. In 1951, Marion and George, along with their two children Michael and Sally, moved from Milwaukee to Los Angeles California. They made their first home in Culver City. As the story goes, George talked Marion into the move by pointing out that she would no longer have to change their children in and out of their snow suits all winter long. Marion and George raised eight children together: Michael, Sally, Bill, Paul, Mary, George, John and Alys. Marion received her Bachelor of Arts degree from Valley State College in Northridge in 1964. Her love for learning led her to continue to take college classes even after getting her degree. She was particularly interested in religious history. George, Marion’s beloved husband, died in January of 1985. Her son, George Mehigan Masek, died in May of 2002. Marion will be deeply missed by her seven surviving children, her daughters-in-law, sons-in-law, her many grandchildren and great grandchildren and her adored cat, Ki. She will be remembered as a beautiful person, both inside and out. She was a devoted and loving mother who encouraged all of her children to pursue their dreams and passions. She was also a wonderful friend whose kindness, empathy and sense of fun were always in evidence. Marion was active in her community and in her church, both in the San Fernando Valley and in San Juan Capistrano. She was a gifted gardener and flower arranger and was president of the Cherry Blossom Garden Club for several years. She also devoted herself to the Christian Science Church as a reader and as a volunteer in the Reading Room. She was one of the first members of the San Juan Capistrano Christian Science Society and was thankful for the loving spiritual community she found there. She was politically engaged, worked on several political campaigns and had a deep understanding of both history and current events. Last but not least, Marion was a talented artist who worked in many mediums, watercolor being her favorite. After her husband’s death, Marion decided it was time to see the world and started traveling, frequently on her own. Among the many countries she visited were Egypt, England, Ireland, Wales and Italy. Marion had a sense of joy de vivre that survived even the loss of her dear son George. For her 91st birthday, Marion said that what she really wanted was to go dancing. And this is how we will remember her: young, gorgeous, her amazing blue eyes looking at her husband as they dance together at the Los Angeles Ambassador Hotel. A Memorial Service will be held for Marion on Saturday, July 21st at 10:30 am at the Christian Science Society in San Juan Capistrano. In lieu of flowers, donations may be made to the San Juan Capistrano Christian Science Society or the Christian Science Church of Fallbrook.